Among coffee lovers mushroom coffee is perhaps unknown. But what is a mushroom coffee? 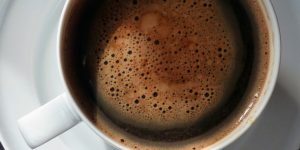 It’s a coffee made by adding dried matsutake and other mushrooms that have been boiled and liquefied into an extract; mushrooms must be cooked to reap the health benefits also the resulting coffee contains extra nutrients and minerals. According to Tero Isokauppila, founder of Four Sigmatic, It’s an excellent coffee to boost your mood in the morning. And this perhaps is one of the healthiest coffees in the world. Here are some of the health benefits of this coffee. The mushroom coffee because it uses mushrooms like matsutake or Chaga mushrooms is a lot less acidic than most coffee. A well-known fact about coffee is that it’s a very acidic drink. But that can be reduced by adding Chaga mushrooms into the coffee. It enhances the taste, and it also solves the acidity problem. Chaga mushrooms are full of antioxidants and also full of anti-viral and immune enhancing effects which are extremely useful in work environments and schools. You get all of this without losing the taste. That is why mushroom coffee is a super way to fight acidity and improve your health. It is well known that coffee boosts your energy, but mushroom coffee does that and more. Coffee can increase your energy because it increases the activity of your central nervous system and also your adrenaline glands. On top of that, you get the extra boost of cellular energy from cordyceps mushrooms. And this is very good because the caffeine stays the same, but you get double the energy, unlike regular coffee. As an additional bonus, Cordyceps also support the adrenal glands. It also enhances your adrenaline, and that results in more effective physical performance. If you drink coffee before exercise, it will enhance your strength and activity during your exercise, and you will not feel tired easily. It also helps your muscles strength which also reduces any muscle pain during exercise which is why mushroom coffee is also very helpful in any mental or physical work. Researchers have proven that moderate drinking of coffee helps boost memory and cognitive performance because of the presence of caffeine in it. Coffee creates vigilance and improves your state of arousal so that you’re more active and less exhausted. Mushroom coffee can improve it even further by adding mushrooms like lion’s mane. Lion’s mane is very helpful for brain tissue regeneration and helps memory and cognitive functions. In Japan, a study was conducted by Dr. Hirokazu Kawagishi, and it was found that mushrooms stimulate the synthesis of Nerve Growth Factor (NGF). NGF acts as key protein nutrient which helps to enhance and to repair neurological disorders. In recent studies, it has been found that coffee can help fight Parkinson’s disease which is a very deadly neurodegenerative disorder. Make sure that it is not decaf because it’s the caffeine that helps you fight the disease. Also, mushrooms like lion’s mane (which is used in coffee) can help with Lyme’s disease. Also, these type of coffees helps fight Alzheimer’s, by boosting your memory. Also, the chance of dementia is highly reduced. Remember again to avoid decaf as it’s the caffeine that helps fight these diseases. The coffee also has antioxidants which are also vital in combating disease in many ways. Because matsutake mushrooms are used in these coffees it is full of vitamins and minerals. According to many doctors and their studies, this coffee is full of vitamins A, B6, C and also thiamine, niacin, and riboflavin. They also contain many other important minerals such as potassium, sodium, iron, copper, calcium, and phosphorus. Copper is also vital because it provides biochemical reaction and produces red blood cell. The potassium found in the mushroom keeps your heart healthy. It also keeps your muscles healthy and strong. The coffee also has no cholesterol and little to no fat which is very healthy. It’s also very effective in fighting cancer without any anti-cancer side effects that the usual cancer medicines contain. So in a way mushroom coffee also help you fight cancer.